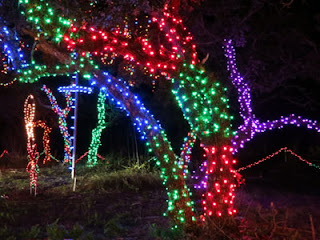 Colorful lights shine at Hill Country Christmas Lights in central Texas. Beautiful displays of twinkling Christmas lights put me in a holiday mood faster than uninterrupted songs of the season on the radio or ever-smiling mall Santas (I love those, too). This year we discovered a new spectacle of lights, music, hayrides, and more that’s attracting hundreds of visitors. 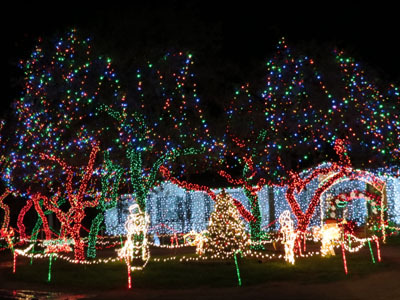 Located one mile north of Johnson City on SH 281, Hill Country Christmas Lights makes sure “Christ” stays in the celebration. 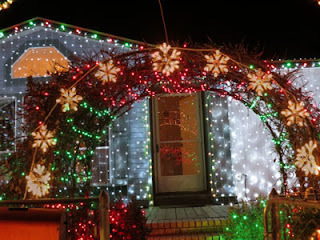 Multi-colored light displays lead towards a house covered in white lights. More than 500,000 lights, more than half of those LEDs, fill the large drive-through display that’s been featured on “Dazzling Holiday Lights” show on the Travel Channel. The amazing thing is that the entire pageant was built independently by 21-year-old Dexter Haynes. Twinkling lights appear to be dancing to the music. Lights adorn 72 post oak trees, 73 wire-frame attractions, a drive-thru tunnel, a 25-foot tall tree, the Holidazzle Dancing Light show, and other delightful decorations. While riding in the comfort of your car, set your radio to their own station, 101.7 FM the STAR and listen to accompanying Christmas music. Earlier in December "The One Silent Night," a live nativity, was held on premises. 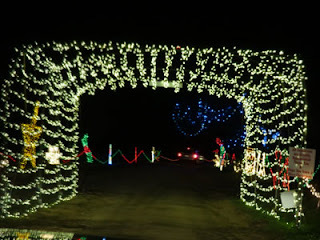 Drive through the lighted tunnel while following the path at Hill Country Christmas Lights display. If you bring a group of family or friends, going on a hayride adds to the excitement. You can book a jaunt through the light display (15 minutes) or ride into nearby Johnson City for stops and pictures at several renowned presentations (one hour), both with a cup of hot cocoa per person. Book at least 24 hours in advance by calling 830-992-7646.